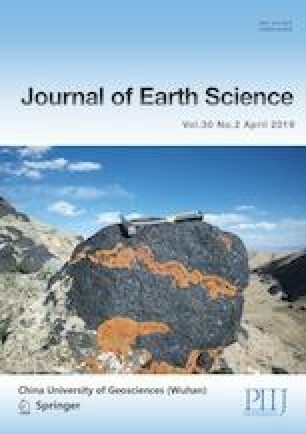 Two Permian-Triassic boundary (PTB) sections (Pojue and Dala) are well exposed in an isolated carbonate platform (Napo Platform) on the southwestern margin of the Nanpanjiang Basin, South China. These sections provide an insight into the transition across the PTB and a detailed investigation of the conodont biostratigraphy and inorganic carbon isotopes is presented. The PTB at the Pojue Section is placed at the base of Bed 10B (a dolomitized mudstone found below a microbialite horizon), defined by the first occurrence of Hindeodus parvus. At the Dala Section, four conodont zones occur. They are, in ascending order, the Hindeodus parvus Zone, Isarcicella staeschei Zone, Isarcicella isarcica Zone and Clarkina planata Zone. Comparison with the Pojue Section suggests the PTB at Dala also occurs at the base of dolomitized mudstone below a microbialite horizon, although the first occurrence of Hindeodus parvus is near the top of a microbialite bed: an occurrence that is also seen in other platform sections. The succeeding microbialite beds developed during the ongoing PTB mass extinction phase. This time was characterized by low carbon isotope values, and a microbialite ecosystem that provided a refuge for selected groups (bivalves, ostracods and microgastropods) that were likely tolerant of extremely high temperatures. This work was supported by the National Natural Science Foundation of China (No. 41572324), the Special Project on Basic Work of Science and Technology from the National Ministry of Science and Technology of China (No. 2015FY310100-11), and the China Geological Survey (No. DD20160120-04). SEM pictures and carbon isotopes data were undertaken at the State Key Laboratory of Biogeology and Environmental Geology (China). We thank Suxin Zhang, Yuheng Fang for their assistance in SEM. Thanks also go to Huyue Song for the helps in processing the carbon isotopes data. The final publication is available at Springer via https://doi.org/10.1007/s12583-018-0884-3.